About a year ago I had made a post about a 'House on A Pole' in Fairhaven beach, Australia. Here is another unusual beach house on a pole. It also has a unique and strange feature that it is connected to the cliff above it by means of a funicular rail, which is the only means of access to it. 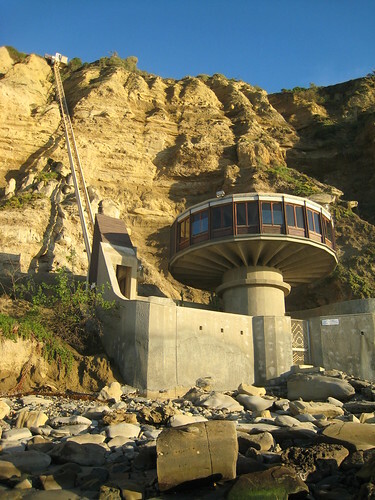 Located on the beach near La Jolla Shores Lane, La Jolla, San Diego, California, the house was built in 1965 by Sam Bell, potato chip baron. Designed by Dale Naegle, it is supported on a 25 feet (~7.6 metres) high concrete cylinder. Initially there used to be car garage at the top of the cliff, however some times later a complete villa was built on top reportedly by subsequent owner. Although the designer had named it as 'The Pavilion' but the locals generally call it 'The Mushroom House' and to me it looks like an Alien Ship! Main source of info: Beach House by Seer, the Master Chronicler, Google Earth Community. Interesting blog, read the above few posts and enjoyed the topics, content, and writing. Very cool how you found the locations in the different engines-- google earth, bing aerial, etc..
Google Earth and Google Earth Community has been my passion for more than 3 years. This blog is an outcome of my browsing the World through Google Earth. I use many tools to find the locations. Some of these are, but not limited to; Flickr, Geody, GeoNames, Google, MSN Bing, Panoramio, Wikipedia etc. In addition suggestions/comments from some of my readers have been a good source of unusual places around the World.